The personal ramblings of Jon Carlos mobile & web developer and technology enthusiast. 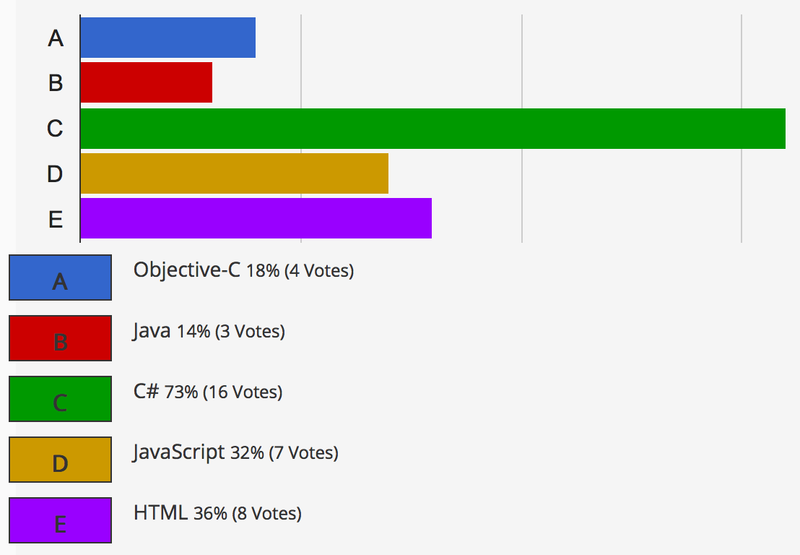 Results of my TwtPoll "What programming languages do you use to build mobile apps?" I'm my day job at Screenmedia I work for a range of clients building mobile apps and websites. We spent a great deal of time looking in to cross platform development frameworks that would allow us to create the quality of mobile app we love using. We spent about 2 years testing different tools and frameworks so woe could pick the route that suited us the best. After all that time we found Xamarin I wrote more about this on the screenmedia blog. Soon after making this decision about Xamarin we started working on a project that took our mobile development team from beginner cross platform developers to Certified developers and Xamarin Consulting Partners in a matter of months. Since we started working with Xamarin I've been constantly surprised by the speed of delivery of new features and also the delivery of zero day support for iOS 8, Apple Watch, Android Lollipop and Wear. This has led me to become a vocal advocate for truly native cross platform apps using C# and Xamarin. I know there are loads of other options for building cross platform apps so to a couple of weeks ago I posted a quick poll asking "What programming languages do you use to build mobile apps?" while I did not receive a huge number of votes I was glad some people had taken the time to let me know what they used. I was also quite surprised that 50% of the developers that voted were 35-44, the next largest age group that voted were the 24-34 group with 32%. It seems that the majority of people that voted were male though some people did not select the option. In such a small sample it's difficult to make anything of this but having been to a few universities to speak to graduates the number of female students is still very low. Thanks to everyone that took the time to vote. I had a little bit of a shopping binge on Ali Express recently spending no more than £3 per item I purchased a bunch of random items I thought would be fun to hook up to a Raspberry Pi. One of which was this little LED Matrix called a Max7219, it had 64 red LEDs in an 8x8 configuration and includes the controller chip required to control them from the 5v pin on a Raspberry Pi. It was all soldered together and came with a 5 pin cable so I didn't need to do anything but hook it up. I found this guide on raspi.tv but I had a completely clean install on Raspbian and I had not configured it correctly so I needed some more help. I looked about a Googled the issues but I did not get a great deal of help so I hope this will help some others that have the same issues I did. First up the pin configuration as detailed in the max7219 python library uses the SPI pins, I did not know theses needed to be configured to be used to while I was trying to run the tests I got this error. It turns out to use the SPI pins you need to run 'sudo raspi-config' to enable access to the pins. below are the selections you need to use to enable them. Once this is done that error should go away and you should be able to access the pins without issue. Next you'll need to get the right software to be able to run the python libraries run these commands and you'll then be ready for the hardware setup. So now connect the pins to your Raspberry Pi following the instructions on github by rm-hull, now we're ready to pull the max7219 library. Now you should be ready for your first test but before hand make sure that all your pins are nice and tight then run.